Presenting the very latest research, trends, and technological advances, Computer serves as a vital tool in helping computing professionals keep up to date on new developments in the ever-changing field of computing. Computer is led by an editorial board with expertise in diverse technical specialties who hail from major universities, research facilities, and global technology companies. Additional multimedia content is now available to subscribers to the enhanced digital edition of Computer, the IEEE Computer Society's flagship publication. The new digital Computer is multimedia-rich, featuring supplemental audio and video content to expand on key concepts. Downloadable, and with clickable table of contents and article reference links, the digital format can be read on a wide variety of devices and archived for easy access to past issues. To begin receiving Computer in digital form this month, visit http://www.computer.org/digitalcomputer. “Computer’s digital version is an effort to offer readers enhanced content in a portable and environmentally friendly format,” said Computer Editor in Chief Ron Vetter, a computer science professor at the University of North Carolina Wilmington and co-founder of Mobile Education, a developer of interactive short message service applications. Computing Conversations, written by Charles Severance, the magazine’s multimedia editor, puts a more human face on technology with interviews and video segments featuring leaders in the field. Out of Band, Hal Berhel’s bimonthly column, challenges and expands our understanding of digital technology’s effects on society. Forward Slash, a monthly column and podcast written by David Alan Grier, former editor of The Known World column, and Erin Dumbacher, profiles the lives, trials, and accomplishments of today’s rising generation of computing professionals. The three new columns join a dozen other regular columns covering all aspects of computing, including education, entertainment computing, identity sciences, security, social computing, and software technologies. Computer is led by an editorial board with expertise in diverse technical specialties who hail from major universities, research facilities, and global technology companies. Area editors represent the field’s breadth in diverse technical areas, including computer architectures, graphics and multimedia, high-performance computing, information and data management, Internet computing, multimedia, networking, security and privacy, and software. For the full list of editors, visit http://www.computer.org/computer. 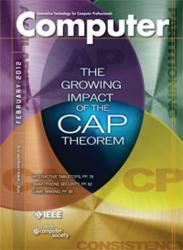 The IEEE Computer Society is the world’s leading organization of computing professionals. Founded in 1946, and the largest of the 38 IEEE societies , the Computer Society is dedicated to advancing the theory and application of computer and information-processing technology, and is known globally for its computing standards activities. For more information, go to http://www.computer.org.